Gallo-Italic, spoken in Piedmont, Liguria, Lombardy and Emilia, and so called because in these regions lived the Gauls; and Veneto. Southern, spoken in Siena and Arezzo. Neapolitan, spoken in southern Lazio, Abruzzo, Campania, Basilicata and northern part of Puglia; and Sicilian, spoken in Salento, Calabria and Sicily. Ladin dialects in Friuli, Dolomites. 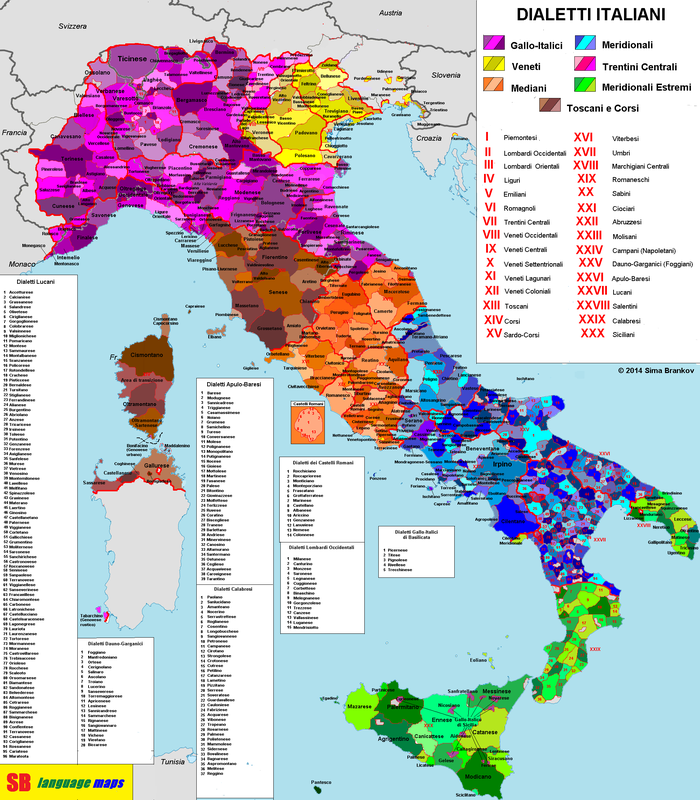 Each of these sub-classes of dialects can be broken down further into hundreds or thousands of local dialects. Still today, it is possible for hilltop villages within sight of each other to speak different dialects.